Our research is focused on emergent dynamical properties of Complex Systems at the convergence of physics, materials science, and biology. A special focus is on applications to cancer biology. Complex systems, i.e. systems with many dynamically interacting units, often display emergent behavior that cannot be anticipated from studies of individual units. Some examples of generic characteristics that are unique to complex systems are spiral patterns, dynamical phase transitions, and spatio-temporal chaos. Our research is focused on complex systems in materials science and biology. Granular Dynamics: In applications to materials science, we investigate the flow of granular materials with an innovative technique that allows us to image the motion and rotations of all particles in the interior of a granular material. Our goal is to understand how seemingly random motions and rotations at the particle level can couple across large groups of particles and lead to strikingly robust collective motion of granular matter such as avalanches or segregation of particles by size. To analyze collective behavior, we use network theory in collaboration with the Girvan group (UMD). Funded by NSF-DMR. 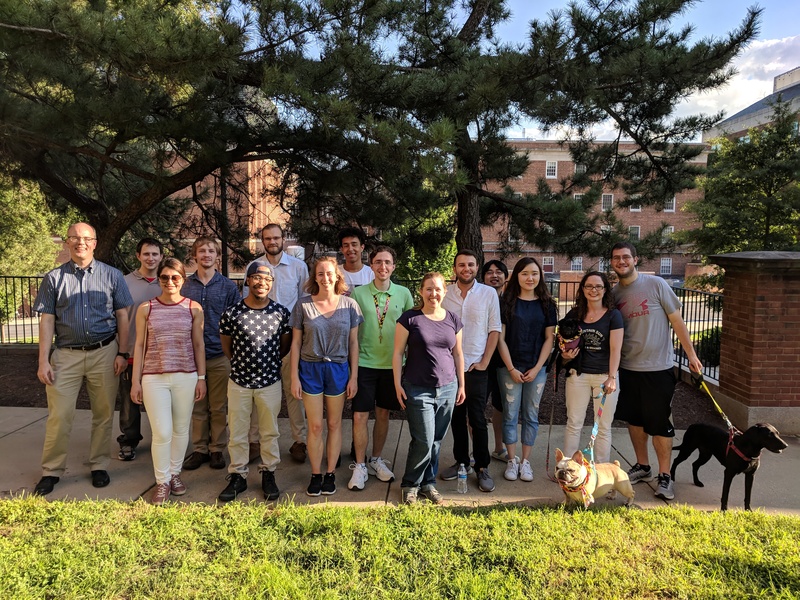 Biodynamics: At the convergence with biology, my group is motivated both by the desire to gain fundamental insights into the behavior of living systems and by the drive to contribute to the pressing challenges associated with the explosion of quantitative information in medical research. Our analysis of shape dynamics of migrating cells has led us to discover mechanical waves as a ubiquitous underlying motor in many fast-migrating cells. Our recent work indicates that the motor for fast migrating cells is based on reaction-diffusion waves start at the leading edge and propagate down alternating sides of the cell. Our goal is to elucidate how surface chemistry and topography affects this migratory machinery, and how internal waves may be harnessed to control cell behavior. To control surface topography we use nanofabrication approaches pioneered by our collaborator J. Fourkas (Chemistry). Funded by NIGMS, NSF and NIST. Cancer Dynamics: In a project funded by a DOD Era of Hope Scholar Award to Dr. Stuart Martin, we investigate the mechanical properties of models of circulating tumor cells. We also apply Complex Systems approaches to investigate cancer related biological processes as part of a Cancer Technology interaction between the University of Maryland and the National Cancer Institute that was formalized in 2010. Work supported by DOD and NIH. Crowd Coding of the Brain: In collaboration with the Kanold and Plenz groups, we are developing new imaging technologies and data analysis techniques that will further our understanding of how large networks of neurons in the brain interact to process sensory information. Work supported by a BRAIN award from NIH. Understanding and Controlling the Coupled Electrical, Chemical, & Mechanical Excitable Networks of Living Systems: In this MURI, we will take a comprehensive, multidisciplinary approach to elucidate, at the molecular and cellular level, the integration of biochemical, electrical and mechanical (BEM) signals in single cells and multicellular collectives. Our approach will include two complementary objectives with the goal to demonstrate how excitable network characteristics will allow for novel approaches to control cell scale behavior at both biochemical and mechanical levels using controlled electric fields (EFs). Our work will exploit recent discoveries by our group and others that biochemical and mechanical intracellular circuits that govern cell mechanics and key sensing tasks have the characteristics of excitable networks. Together, this MURI will provide a robust foundation of basic biophysical insights that will provide the cornerstones for new man-machine interface designs geared to physiology and human performance. Work supported by a MURI from AFOSR. John Giannini defended his PhD thesis on Dec 14, 2018. Congratulations Dr. Giannini! Desu Chen defended his PhD thesis on Aug 13, 2018. Congratulations Dr. Chen! S. Chen, M.J. Hourwitz, L. Campanello, J.T. Fourkas, W. Losert, C.A. Parent, "Actin Cytoskeleton and Focal Adhesions Regulate the Biased Migration of Breast Cancer Cells on Nanoscale Asymmetric Sawteeth", ACS Nano, 2019. Please contact wlosert @ umd.edu for questions about the Dynamics of Complex Systems lab. Thank you to Deborah Hemingway for taking our group photo! Copyright (c) 2019 Wolfgang Losert. All rights reserved. Design by FreeCSSTemplates.org.